Berg Insight, today released a new market report covering the cargo tracking market. 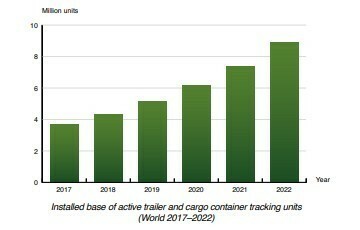 The number of active tracking devices deployed for cargo loading units including trailers, intermodal containers, rail freight wagons, air cargo containers, cargo boxes and pallets reached 3.7 million worldwide in 2017. Growing at a compound annual growth rate (CAGR) of 19.6 percent, this number is expected to reach 8.9 million by 2022. Trailer telematics is today the most developed market, however in terms of installed units the intermodal container tracking market is expected to take over the leading position during the forecasted period. The markets for rail freight wagon and air freight cargo tracking are considerably smaller but will grow substantially during the coming five years. Berg Insight ranks ORBCOMM as the largest vendor of tracking solutions for cargo loading units, having a significant installed base of trailers as well as containers. The company has been highly involved in M&A activity related to real-time asset tracking, including notable acquisitions such as Blue Tree Systems, Euroscan and WAM Technologies. ORBCOMM has been involved in the Maersk/AT&T project to equip Maersk’s entire fleet of nearly 300,000 refrigerated containers with real-time tracking solutions. The project is one of the largest cellular-based industrial IoT deployments of its kind. ORBCOMM is together with SkyBitz, Omnitracs, Spireon and I.D. Systems the leading players on the North American trailer telematics market in terms of number of active units. The European trailer telematics market is considerably smaller than the North American and is dominated by Idem Telematics, Schmitz Cargobull and Novacom. On the market for container tracking solutions, two major vendors are Envotech and Numerex based in Malaysia and the US respectively. Asto Telematics and Nexiot based in Europe and Amsted Rail based in North America are significant vendors of tracking solutions for rail freight wagons. Sensitech and Sendum Wireless are moreover notable players in the general cargo segment, also offering solutions for air freight cargo tracking. Tracking of trailers, containers, rail wagons and cargo boxes has become increasingly common across all markets during the past years. 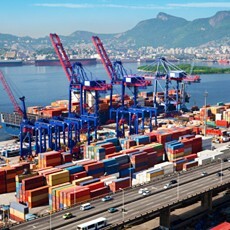 “The market for remote tracking solutions for cargo containers has entered a growth period that will continue for several years to come”, said Martin Bäckman, IoT Analyst at Berg Insight. He adds that there will be a strong focus on increased supply chain visibility and transport security in the coming years.